A James Bond fan bought an Aston Martin DBS that was crashed and destroyed in the new upcoming James Bond movie called “Quantum of Solace.” They buyer paid £60000 ($105000) more than the price for the new Aston Martin. The car was destroyed when a test driver crashed off a damp mountain road near Lake Garda, Italy. 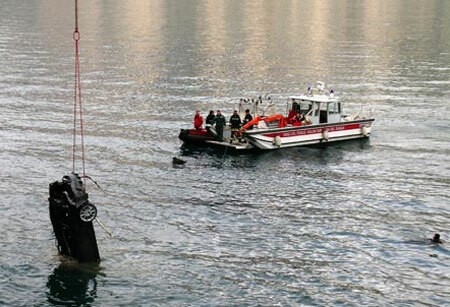 The driver was knocked unconscious and sank 150 feet to the bottom of the lake, before freeing himself and swimming to the surface. Remarkably, he was not injured. The collector paid £200000 ($352000) for the totaled Aston Martin and the cost for brand new Aston is £134000 ($235700). How crazy is that?